Hey guys! Don't forget to enter my Halloween giveaway! Today, I have a couple more polishes from Liquid Lacquer! 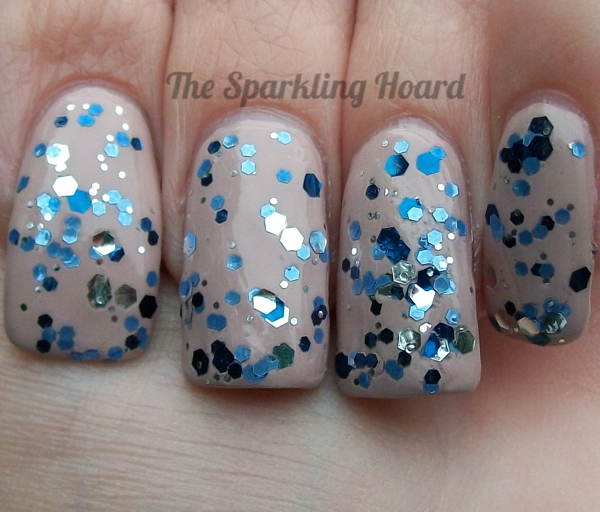 Damn, It's Cold is a clear glitter topper containing a mix of metallic silver, royal blue, and periwinkle blue glitters. The formula was good and dry time was average. Shown is one coat over Zoya Kennedy. Just Blue Myself is a medium blue scattered holo. I'm not sure why its description calls it a linear holographic, because it's definitely a soft, scattered effect. Unfortunately, my camera didn't want to show the holo sparkle. It's more sparkly than it looks here! The formula was good and dry time was average. It takes 2-3 coats to achieve full opacity. Liquid Lacquer polishes cost $8-$11 for 15mL, making them a very affordable indie! The brand often offers coupon codes, so be sure to check their Facebook page before placing an order!